Discussion in 'Contrails and Chemtrails' started by Mick West, Oct 26, 2018. In a very positive move, You tube has added a link to the Encyclopedia Britannica article on Contrails to most of the videos that promote the "chemtrails" conspiracy theory. It's a great article to use as the initial excerpt directly addresses the most common misconceptions about contrails - the idea that they always quickly dissipate. Contrail, also called condensation trail or vapour trail, streamer of cloud sometimes observed behind an airplane flying in clear cold humid air. It forms upon condensation of water vapour produced by the combustion of fuel in airplane engines. 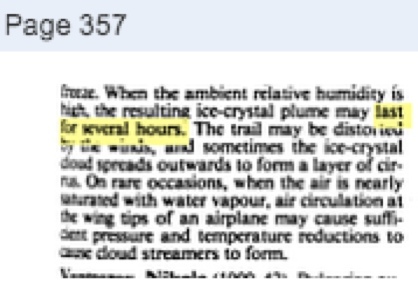 When the ambient relative humidity is high, the resulting ice-crystal plume may last several hours. The trail may be distorted by the winds, and sometimes it spreads outward to form a layer of cirrus cloud. While this might elicit cries of "propaganda" or "censorship", the information provided is both accurate and verifiable. I think the addition of neutral factual information to an otherwise highly misleading video is a good thing. YouTube app on Android phone. Typed "chemtrails". Top hit has 1.2m views. No added EB info. Neither through Chrome on Android phone. Is it perhaps in specific countries? It doesn't work on my Android phone in US or IE on my computer. It does on Firefox on my computer. I noticed today that Youtube has also pinned Encyclopedia Britannica articles to Moon Hoax and 9/11 Conspiracy videos. I searched some conspiracy topics (qanon, gmo, pizzagate, moon hoax and 9/11) and it appears to me that they have also recently changed their search engine as well. More "reputable" sources are now on the top of searches, while the more questionable sources, ones that push "conspiracy", have had their content pushed down, as well as some topics getting these new E.B articles pinned above the title on their videos and at the top of the search screen. I can't see this anywhere. Probably US only. Is it also on Dane Wigington's videos? I just did a search for "geoengineering", Dane Wigington's channel comes up as the top search. Out of the 3 videos of his at the top of the search (pictured) only the bottom one has an E.B article pinned to it. Checking through a few of his videos from his page, some are flagged, some are not. I think he's getting around this someby not using the words "contrails" or "chemtrails" in his video titles or description. I've removed the word "all"
This has me wondering if they got my comments... I've been flagging chemtrail videos (and other nonsensical videos) telling YouTube that they are LEGALLY complicit in advancing lies that fuel and even create persecutory paranoid delusions that lead to people commenting about "shooting down" airliners that they think are "chemtrail planes", possibly leading to a terrorist attack against an airliner. But, of course, I doubt that I single-handedly caused this (since I'm not a fan of delusions). I don't see any here in the UK either. When someone says that its a positive move that Youtube starts to add opposite viewpoints to any video that claims something other than the "official truth" they loose all credibility in their socalled search for truth. Those are not "opposing viewpoints" though, they are simple factual articles from an encyclopedia. Not happening here in Spain. I switched on a VPN to make it seem I was in the US and the banner's not appearing on individual videos either, including the one mentioned in the OP. When I switch the VPN off, it's no longer there. I guess they really are targeting the main market with this. Different subject matter, but related: Last night, my wife went to show me a video of something (Putin holding a cat, so nothing particularly out there), and the first result was a Russia Today video. The Android app now has a (paraphrasing) "Russia Today is majority owned by the Russian government" banner similar to these contrail ones. "Russia Today is majority owned by the Russian government" banner similar to these contrail ones. Those have actually been around for longer than these Encyclopedia notices. I saw that RT banner months ago. Huh, that's interesting. Neither of us had seen it before. In one small step towards that commitment, today we will start rolling out notices below videos uploaded by news broadcasters that receive some level of government or public funding. We’re rolling out this feature to viewers in the U.S. for now, and we don’t expect it to be perfect.